During the import I’m calculating the number of cases per line item. I need to know the total case count per order. I’m guessing this is the best way to do this. The syntax checks out okay but when I run it I get the exception message. I need this to establish the correct carrier based on the load size to avoid office staff having to manually do it for each order. I know what to do before and after the script I just need a little help keeping a running sum of the case count per order. I guess you have just to change two lines. In case this doesn’t solve your problem please post the exception text on If possible the created definition file. Sorry but scripts are just not my thing…trying to learn but so far I know just enough to be dangerous. See attachment for more info. Please find below the modified script, it´s working on my side. Note: The script but´s just in the last record for each order the right count! In the attachment…I’m trying to match the Desired Results column. This column would not be in the actual import file, I put it there just for comparison. I need the total case count per order then assign the appropriate carrier. As it is now office staff makes that determination after the import is complete. For this you need a second Definition. With the first Definition you have to use the GroupBy Heater to calculate the count like described in your first post. For the output are just two fields (order number and the calculated Count) necessary and the output must be a CSV file . In the second Definition you have to implement a CSV Lookup with the String Replace Heater . This replace the unique criteria “Order Number” with the desired count. I kind of had a feeling that’s where we would end up. I have everything working with the exception of the Batch Module, I’m not sure how to run it or even what to do. 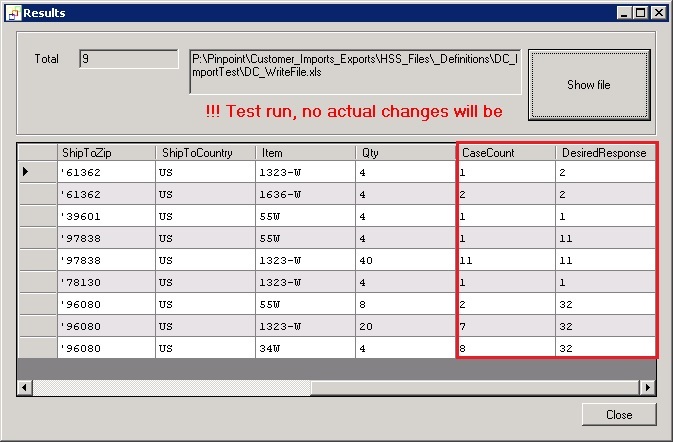 For now they are able to run the first definition to get the case count then run the import. That in itself is a huge improvement but if I can eliminate one more step in the process I’ll be a rock star. Please find attached a short example. The first definition creates just the CSV Lookup text file for the “casecount” field. The second definition import the data into the desired Excel sheet. In the ZIP archive I’ve also attached a short Batch cmd script for the automation. NOTE: To run this example you need FlowHeater Version 3x! I have to say I'm loving the Batch finding new things to use it for. Thanks for all the support...as always.